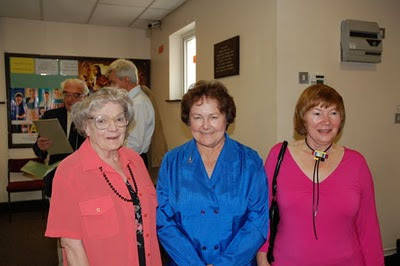 (from left to right) Valerie Brent, former nurse at Craig-y-nos, Cynthia Mullan, director of Sleeping Giant oral history charity and Ann Shaw , former patient at the first patients reunion. Valerie, who worked as a nurse in Craig-y-nos during the 1940s, rang to say that she celebrated her 80th birthday last Tuesday with a big party. In fact she has a month of celebrations coming up culminating in a special dinner with her daughter and son-in-law at Celtic Manor hotel ( of Ryder Cup fame) when they celebrate their Pearl wedding and Valerie her 80th birthday. Quite a party girl is our Val.